The researchers, Giovanni Romanelli and coauthors at institutions in Italy, France, and the UK, have published their study, "Direct Measurement of Competing Effects on the Kinetic Energy of Heavy Water upon Melting," in a recent issue of The Journal of Physical Chemistry Letters. To measure this phenomenon of competing quantum effects, the researchers used deep inelastic neutron scattering (DINS), a process that involves deflecting neutrons off the atomic nuclei, where the angle of deflection provides information about how the nuclei behave during the scattering process. The only instrument suitable to perform measurements of the nuclei's momentum distribution using this technique is the VESUVIO spectrometer at the pulsed neutron source ISIS, located at Rutherford Appleton Laboratory in the UK. Using these measurements, supported by computer simulations, the researchers could directly verify the existence of competing NQEs. Specifically, one NQE is associated with motion perpendicular to the plane of the water molecule, while another NQE is associated with motion parallel to the hydrogen bond. 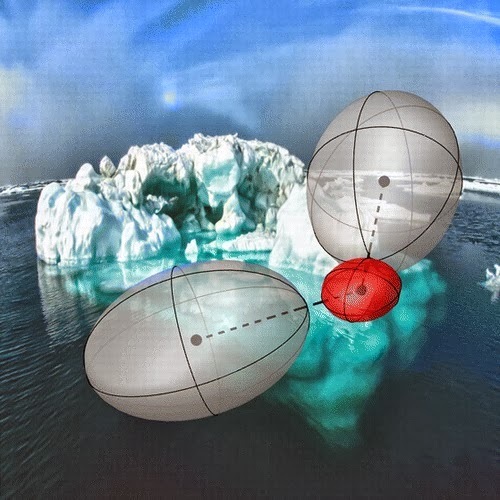 The experimental observations clearly confirm concepts that were previously introduced by theory. "Theoretical analysis and indirect experimental evidence—such as the shift of vibrational peaks in infrared spectroscopy–suggested the concept of competing quantum effects," coauthor Michele Ceriotti at the University of Oxford in the UK told Phys.org. "This study provides a very direct demonstration of this concept, by measuring the change of the quantum kinetic energy of deuterium and oxygen in heavy water upon melting. A degree of competition between different components of nuclear quantum effects can be expected in most hydrogen-bonded systems, and this work demonstrates the possibility of accessing this information directly by deep inelastic neutron scattering experiments." In this case of water, the competing quantum effects lead to the somewhat surprising result that the melting and boiling temperatures of light (ordinary) water differ very little from those of heavy water. Because heavy water contains deuterium, which is twice as heavy as the hydrogen contained in ordinary water, one might expect that NQEs would affect them very differently. In reality, their melting temperatures differ by less than 4 K and their boiling temperatures differ by even less. This small difference occurs due to the fact that one NQE increases as the other decreases, resulting in a small net effect. Although the scientists here focused on the case of water, competing quantum effects have been identified in a variety of simulations involving light nuclei, and could help explain their quantum behavior. "The results we present here give further support to the concept of competing quantum effects, which can now probably be deemed established," said coauthor Roberto Senesi at the University of Rome Tor Vergata in Rome, Italy. "Furthermore, the procedure we follow in analyzing experimental data makes it possible to extract as much information as possible–namely the anisotropy of the environment of protons–from a very delicate experiment. "This provides one more tool for helping researchers to gain knowledge of the nuclear quantum effects on the local hydrogen environment, which is necessary to achieve a complete understanding of reaction mechanisms in chemical reactions involving hydrogen–which include acid-base chemistry as well as many enzymatic reactions." In the future, the researchers hope that instrument upgrades planned on VESUVIO will enable them to make measurements with greater precision of both light and heavy atoms, which would provide additional quantitative information on the momentum distribution and other particle properties. "We plan to extend the work to light water and other tetrahedrally structured systems, as well as to materials where the motion of light components, such as lithium, is greatly influenced by quantum effects," Ceriotti said. "To achieve these goals, it will be important to improve even further our control over the theoretical and experimental techniques, so as to achieve a level of accuracy sufficient to capture the subtle changes in kinetic energy upon reaction or phase transformation."